Will the power of social media be enough? Jonathan Hopkin, 38, from Nottingham tweeted three images of the ring, which he said was found by his wife and was inscribed with the letters A and P.
“Right, need your help twitter folk,” Jonathan wrote. 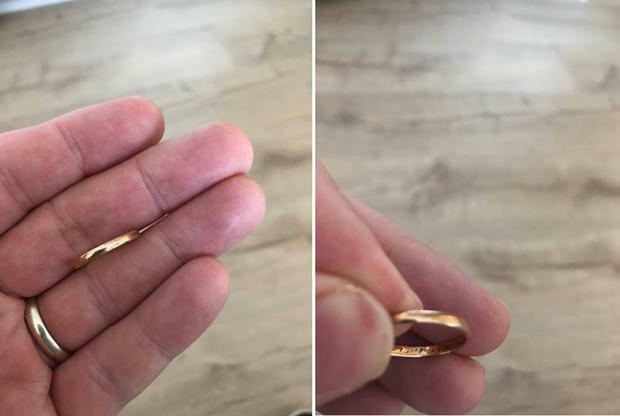 “My wife has found this wedding ring and it has the date 15.9.55 and the initials A and P inscribed on it. Right, need your help twitter folk. My wife has found this wedding ring and it has the date 15.9.55 and the initials A and P inscribed on it. I know it’s a long shot but we’d love to get it back to who it belongs to. Social media soon jumped into action, retweeting the post in their thousands and offering detective work of their own. “My wedding ring means so much to me, I’d love to be able to get it back to the owner or their family,” Jonathan told the Press Association. If you had some idea where they lived, you might be able to use electoral registers, but I don't think you have enough information. Others simply expressed their desire for the ring to find its owner once again. You can go to a priest and ask him to consult the church records. All Catholic weddings are registered. I do not know if there are any, but here in Brazil we have civil registry offices where birth certificates, marriages and other documents are stored. Here’s hoping the precious item finds its way back home soon enough. Furious bride slams 'attention seeking' bridesmaid who dyed hair pink before wedding - but can she 'uninvite' her?